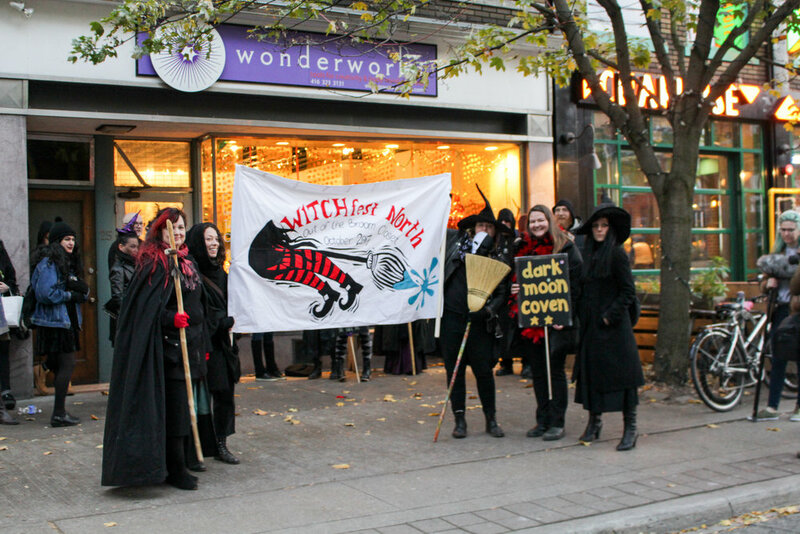 The inaugural celebration of Witch pride in Toronto brought together Witches, Wiccans and Pagans to bring visibility to one of Toronto’s most unknown communities. In Canada, it used to be illegal to fraudulently pretend to exercise or to use any kind of witchcraft, sorcery, enchantment or conjuration. Strangely enough, this law isn't from 1692 as most would expect. It’s from 2017. This unusually specific law, listed in section 365 of The Criminal Code of Canada, was repealed this past summer, sparking a wildfire of celebration amongst practicing Witches across the country. One of the brightest sparks of celebration was right here in Toronto. Monica Bodirsky is a practicing Witch and founder of the Dark Moon Coven. She is also the program director and founder of WITCHfest North, a city-wide arts festival that wrapped up its inaugural celebration this past Sunday. The idea behind a festival that celebrated Witch pride grew out of Bodirsky’s desire to breakdown stereotypes and misconceptions that have surrounded Witch culture for decades. Co-ordinating with the cycles of the moon, WITCHfest North held events throughout October and into early November. These events celebrated women in the arts and created a safe space where the Witches of Toronto could come together and be seen as a visible group. To kick off the celebration, an introductory meet-and-greet was held at Wonderworks, a metaphysical supply store that served as the central hub of the festival. Rochelle Holt, the owner of Wonderworks volunteered the shop’s services based on their long-standing relationship with Bodirsky. Wonderworks, located at 25 Baldwin St. (D. Dejene). Other events included oracle and Tarot card readings hosted by the Lucky Divination Parlour, a panel discussion entitled “The Legacy of the Witch,” The Witches Attic Antique Sale, a pop-up shop where crystals, literature and spiritual supplies could be sold, and even a masquerade ball which included a dark art exhibit. The main draw of the festival however was the WITCHwalk held on Halloween night. A crowd of Witches, some festively sportingpointy hats and broomsticks and others dressed simply in black, gathered outside Wonderworks to begin their march through the city streets. An entirely peaceful outing, the Witches paraded through the city, not to protest or argue, but simply to gain something that their community has been sorely lacking: visibility. Stephanie Dayes, representing the Dark Moon Coven on the WITCHwalk (D. Dejene). Real-life Witches share zero similarities with the otherworldly beings that have been portrayed in popular film and television series such as The Wizard of Oz, Sabrina the Teenage Witch and American Horror Story: Coven. Green skin, talking cats and the power to raise zombies from the deadare nothing more than imaginative works of fiction. Bodirsky’s personal definition of a Witch is a woman who is empowered and uses traditions of herbalism and energy to heal people and to change their environment for the better. Bodirsky’s made it clear though that women who identify as Witches each have their own definition for the term and her’s is not universal. For each Witch, the meaning and beliefs are different. “I find one of the core beliefs in Witchcraft, Paganism, Wiccan, etc. is self-empowerment, being very proud of the being that you are, however strange or abnormal, however people perceive you,” said Brett Seivwright, one of the few male Witches attending the WITCHwalk. Beginning at Wonderworks, a crowd of about 20 Witches set out on the WITCHwalk, their destination was the Toronto Public Labyrinth in Trinity Square Park. Bodirsky, proudly displaying a banner with the festival’s logo, briefly addressed the assemblage of Witches. Raquel Ellesmere and Brett Seivwright show off their Witch pride (D. Dejene). “It’s time we came together as a unified group and come together at least once a year to discuss our points of view as a unified group. Being proud of who we are is vital,” said Bodirsky. High-pitched cackles and chants of, “we are the weavers, we are the web, we are the witches back from the dead,” filled the air as the proud group marched on, smiling and waving to their curious onlookers. When the group finally arrived at the Toronto Public Labyrinth, they formed a circle and began the ritual of Samhain, which marks the end of the harvest season. The ritual is a way to honour their ancestors and those who have become before them whether they know them or not. Offerings of roses for love, sage for cleansing, and mugwort which gives the overall offering a special boost, were among the gifts left for the ancestors during the ritual. Monica Bodirsky leads the group of Witches on the WITCHwalk (D. Dejene). “This time of year the veil [between worlds] is very thin and we can actually communicate with them a lot easier so we leave them offerings,” Sharmila Dey, one of the Witches participating in the ritual, said. Whether it’s food, herbs or, flowers, the offerings left behind are a way of acknowledging and thanking the ancestors letting them know that just because they are gone does not mean they are forgotten. Dey left offerings for her grandparents and great-grandparents, both of whom she had never met. “I just let them know that I know they’re still around and if they want to communicate with me through any signs or if they want to come to me in my dreams, that I’m listening and I’m here for them and I thank them for the opportunity to be here today,” Dey said. The following night the festival concluded with an intimate town hall meeting at Wonderworks where the organizers and participants could discuss the successes and missteps of the event as a whole. The group agreed that the opening and closing ceremonies were highlights, but press coverage was definitely lacking. Bodirsky pledged to not rest until WITCHfest North 2018 ends up on the front page of The Toronto Star. Keeping the ideals of visibility, diversity and pride are at the heart of preparations for next year’s event, as Bodirsky has already eagerly begun planning the celebration.